The site of the Empire State Iron Works is located a few miles south of Trenton between Highway 11 and Lookout Creek. This area appears on the Trenton, GA/AL quadrangle (101-SE) of the U.S. Geological Survey maps. Furnace base at Empire State Iron Works. 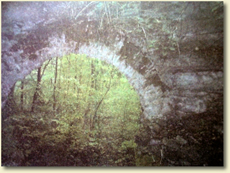 It has been said that Dade County is the only area in Georgia with sufficient iron and coal deposits to sustain a full scale iron industry. As early as 1840 Benjamin Hawkins established a bloomary forge about four miles south of Trenton, and produced some iron on the site. This facility was abandoned in 1851 and described as being in ruins by J. P. Lesley in his Iron Makers Guide, published in 1859. James A. Nisbet, the father of Colonel James Cooper Nisbet, wrote on October 3, 1862 in the Macon Daily Telegraph, that parties were coming to Dade County to engage in the "manufacture of iron on a noble scale. Lowe & Co., who are refugees from St. Louis and New Orleans, are organizing their operations and are backed by strong Capitalists of the latter City." These individuals selected a site near the old Hawkins Forge and later that year, or in 1863, work began on the Empire State Iron Works. This facility, operating under contract with the Confederate Government, was in the final stages of construction when the Federal Army of the Cumberland occupied Dade County in September 1863. On September 5th General Negley sent out reconnaissance patrols to investigate the area. One of the groups found the Empire State Iron Works. The workers had abandoned the site and fled to the mountain, but the soldiers did take a number of items. General Negley sent the following report to Corps headquarters: "An officer just returned from the party sent out to reconnoiter in the direction of Johnson's Crook reports the capture of the following articles, viz: Large lot of spades, picks, and shovels, 29 pairs of shoes, 146 sacks shelled corn (2 bushels), 13 sacks oats, 6 kegs nails, 1 keg fuse, 2 kegs white lead, 250 sacks wheat, lot of stationary, 1 keg blasting powder, 39 sacks salt (22 sacks since used and destroyed by Thirty-ninth Indiana Mounted Infantry, 1 sack cotton, 1 barrel tar, 3 barrels lard." He later reported the capture of additional items from the iron works: "between 200 and 300 bushels wheat, 35 sacks shelled corn, 16 sacks oats, 6 bushels onions, 20 head of cattle -- the property of the Empire Iron-Works. "General Rosecrans was in a hurry to get his army over Lookout Mountain to confront the Confederates, and the iron works were left intact when his forces departed Lookout Valley. The site came to the attention of Federal forces again two months later. Furnace entrance at Empire State Iron Works. When General William T. Sherman was bringing his Army of the Tennessee to relieve the siege of Chattanooga in November 1863, he wanted, in so far as possible, to deceive the Confederates as to his true route and purpose. To this end he sent his brother in law, General Hugh Ewing, with a division, to invade Dade County from Bridgeport. Ewing's instructions were to light numerous fires and create such a disturbance that the Confederates would think that Sherman was bringing his entire army in that direction with the intention of striking the Confederates by moving up Lookout Mountain and Rosecrans had earlier done. In the meantime, while the Confederates were thus distracted, he would bring the army directly to Brown's Ferry by way of Whiteside. View from inside the furnace at Empire State Iron Works. General Ewing carried out his instructions well and on November 20, 1863 reported to Sherman from Trenton, saying: "Loomis camped 5 miles above Trenton at the iron works I am destroying the iron-works, and hope by morning to see them all fall to lawless ruin." The same day, Ewing ordered Captain Cassell, Division Engineer, to begin the work of destroying the iron works: "You will proceed at once to destroy the machinery and stacks of all iron-works in Lookout Valley, using fire, or powder. Make the work thorough, also destroy all tanneries and machinery of mills attached to the iron-works." He issued similar instructions to General Course who was camped near the Empire Iron Works. "Set parties at once to undermine and destroy the stacks and machinery of all iron-works in your vicinity, but do not burn or blow them up -- do it without noise. Cassell is coming with tools, but do what you can." In his final report on his action in Dade County, Ewing stated: "While in the valley we destroyed the iron-works, breaking to pieces the engines and machinery and leveling the stacks to the ground." In spite of this claim, visits to the iron works sites in 2001 demonstrated that the destruction was much less than complete and in fact remains of both furnaces are still present. The property is owned by Mr. Bobby Ryan of Trenton. 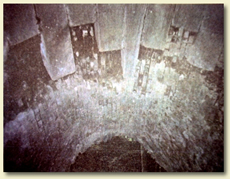 Second view from inside the furnace at Empire State Iron Works. Significant Views: The owner of the property has stated firmly that he wishes to keep his property out of any public use activity. It was not visited during the present project out of respect for his wishes. All the above information was gained from archival sources or from interviews with former land owners. Setting: The furnace site is in an undeveloped wooded area between Highway 11 and Lookout Creek. 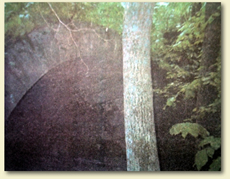 Documented Structures, Sites and Features: The focal point of the site was the large limestone furnace built for the manufacture of iron. There is a small amount of slag on the property that shows that some iron was made before the Federal army captured the site. 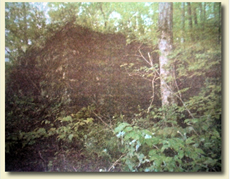 Presumed Wartime Features: In addition to the furnace there would have been casting sheds, storage buildings, and living quarters for the workers on the property. There were several brigade size campsites here in September 1863. Relic collectors have amassed a considerable quantity of Federal material from these camps.